If you said 'Yes!' to any of the above statements then this course is for you. I am very grateful for this course. It gives me great motivation to work on my child themes. Everything was easy to follow and Michelle is a fantastic teacher. The Facebook Group is also a large dose of knowledge and motivation. I would certainly recommend this course to anyone who needs a small push and a whole lot of support to get started. Michelle is a wonderful instructor… she has a great passion for what she does and is uniquely generous with her knowledge. I myself have spent many years as an instructor, so I can honestly say that Michelle is a rare breed. I signed up for Divi Academy and was pleasantly surprised at just how much you get for the price but the real value lies in the fact that this is a course that you can start benefiting from, straight away. The course is well structured and served up in manageable bite-sizes. There is always a wonderful community of students, who all talk and share ideas, which is the “true testimonial” to how respected and talented Michelle is as a teacher. I’m a big fan of process and consistency – Michelle provides both by not only sharing her knowledge but also her tool kit of resources. If you have a question, you just have to ask, Michelle does her best to provide you with answers but also inspires you through her own themes and relevant webinars are a big bonus too. The “Above and Beyond” support she provides is priceless. I’m looking forward to many more courses from Michelle. Thanks so much for the course it came at the right time and it provided so much insight that I would consider it to be the best money I ever spent on learning. I loved the course structure, I also loved the insights you provided of your own experiences and the useful links, I thought I had it all covered until the course came along and proved me wrong. The experiences you shared was worth the course amount for me, simply because I didn’t have to go re-inventing the wheel rather gained the knowledge you had gathered over the years by following the course, thanks for openly and so willingly sharing your experiences with us. Michelle's course helped me to speed up my working process on my client's websites, make me more organised and the resources shared by her in the course save me countless hours of research. Looking forward to new courses created by Michelle. Thank you very much Michelle for a rich source of knowledge. You are an excellent teacher. I've learned a lot of things and the community of Divi academy on Facebook is also great. Now I feel more prepared for further “Divi life”. The course is well organised and information added or updated as requested by students. Amazing support from Michelle and other participants in the Facebook group. I am not techie so I have learnt a lot, my head is brimming with ideas! Really enjoyed being part of the community and look forward to more of Michelle’s courses, I’ll be back! I was intrigued when I first saw a notice about Michelle’s child theme course, and decided to go for it. In the first year since taking the course, I have made $20,000 from the sale of my child themes. I am thankful every day that I took this course, as it has paid for itself many, many times over, and I am now able to spend my time doing something I really enjoy. I was so excited to have my child theme accepted on Elegant Marketplace, that I want to thank you Michelle. Enrolling in the Divi Academy - Child Theme Course is probably the best thing I have done for my business. The other students were all so supportive of each other, it was like we were all trying to help each other. I am so happy that I took your course. Besides the value that I have added to my business, I have made a lot of friends and contacts within the Divi community. Thank you again Michelle, you are a great teacher. I would highly recommend the Divi Child Theme course to anyone looking to sell their designs. The course materials provided are brilliant and extensive. Step by step instructions to walk you through the process; lifetime access and updates; and the most brilliant support system via Facebook. Michelle has created a warm and supportive community that shares ideas freely and Michelle herself is extremely generous in sharing her knowledge and her time. She provides more than just instruction - acting as a mentor and advocate. Michelle is an excellent teacher. She's clear and to the point. 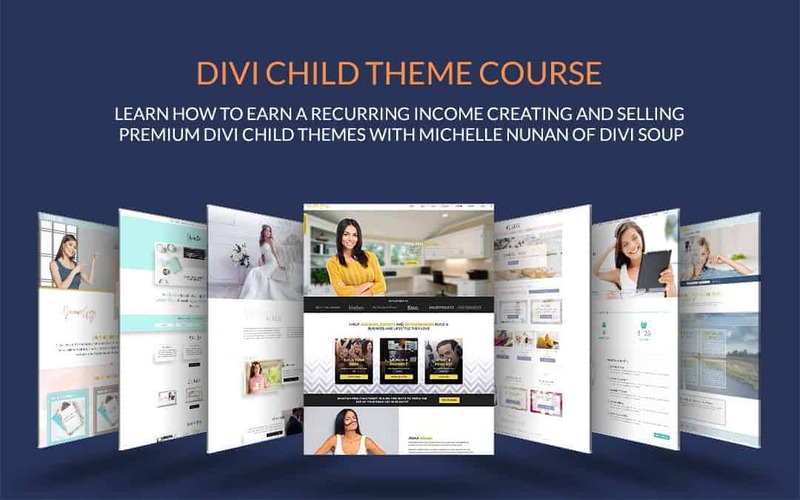 The structure of her Divi Child Theme course is easy to follow and makes sense. The descriptions are clear making it easy to go back and find what you need. The downloads are great to use as examples and there are plenty of tools to help you on a professional level. She keeps adding to the value with links and webinars. The Facebook group is filled with students that are willing to help each other and Michelle comments and helps with every problem and question. I've written her personally and she's quickly responded every time. If you want to take your skills to the professional level I highly recommend Michelle's courses. The live webinars are fantastic and Michelle is the most patient teacher I have ever had. Michelle demonstrates and explains everything that you need to understand which is great for a newbie like me. I really appreciate everything Michelle does and I cannot wait to learn CSS from her too as I know Divi Academy is a place where the teacher really wants to give you all the information you need and it is evident Michelle loves teaching! The private Facebook group is also great, everybody is so helpful to each other no matter what your skill level. This was the best money I have invested in a long time. Michelle’s Divi Academy Child Theme Course covers a lot of information, delivered in modules that are easy to understand and refer back to. Not only is the course well-structured Michelle provides so much in examples, guides, and resources of all kinds. I would have never thought that I would be able to create and sell child themes. 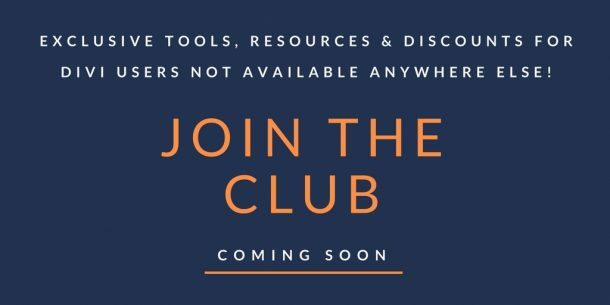 In addition to the course materials there is a Facebook Group that has become a wealth of information and support. This course gives you the confidence to make the leap! Many thanks to Michelle @divisoup.com!